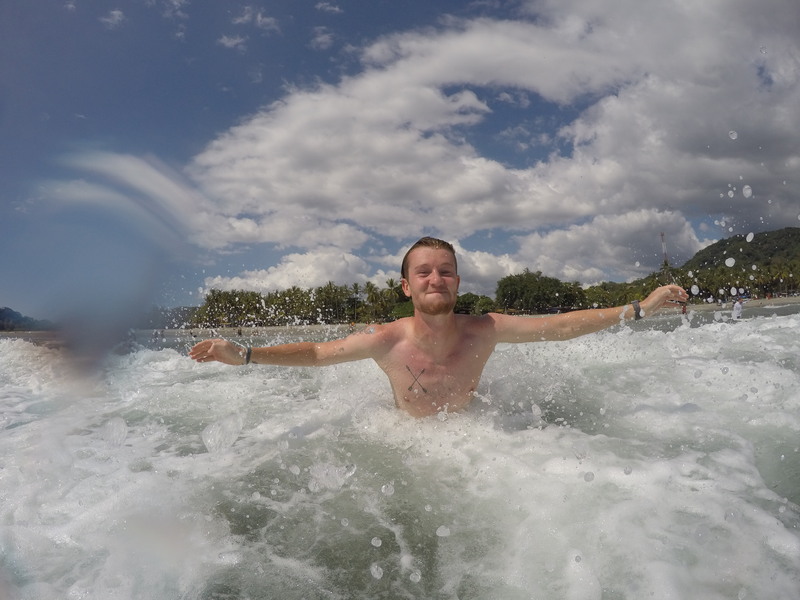 After a hectic ‘Filthy Friday’ in Bocas, we struggled, hungover, through the very rainy and wet journey back to the mainland, where we haggled a shuttle to the border. None of us really knew how long this border crossing would take and were preparing ourselves for a long day – last time I was here there was quite a queue – so we were very pleasantly surprised to find absolutely no one else there at all and just sailed through. We walked across the bridge into Costa Rica, got our entry stamps (after convincing the woman that it really was Conor in his passport picture) and that was that. Welcome to country no. 4 on this epic adventure. 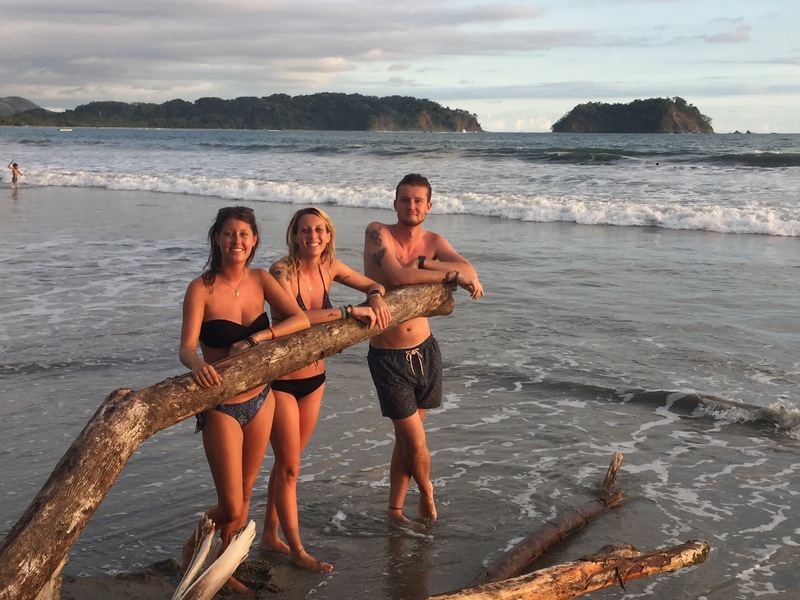 We took a public bus to Puerto Viejo, a place I had visited before and was keen to see how it had changed. When I stepped off the bus I remembered immediately why I loved this place so much the last time. Super chill vibes and pretty surroundings make me happy, what can I say? As there were 5 of us, we’d rented an awesome little airbnb about a 10 minute walk from the centre of town and it was so nice to have our own private space after so many weeks in shared dorms and noisy hostels. The house we were staying in was so cool – all open-windowed and no walls downstairs, so you could be inside but also outside at the same time. We spent our few days in PV just hanging out, exploring the little town and enjoying a bit of down time after a busy week in Panama. I really loved it. Our next stop was supposed to be La Fortuna but, after some confusion and miscommunication with the guy at the bus station, we didn’t end up leaving Puerto Viejo until the afternoon, so there was no way we were going to make it all the way north in one day, considering the last bus from San Jose to La Fortuna departed at 12:30pm and we didn’t get on the first bus until 1pm! Oops. We actually ended up staying in a really cool hostel called ‘Pangea‘ in San Jose though and had a great evening enjoying good food and each other’s company, so it wasn’t really too bad of a mess up after all. We got up bright an early the next morning to catch the bus to La Fortuna and thankfully this journey went off without a hitch. We arrived in the early afternoon, checked into La Choza Inn, our hostel for the next few days and went for a wander around the town. It was exactly as I remembered from my trip 3 years ago, so it was cool to be able to show the others around a little. Luck was also on our side that day and we managed to get ourselves onto the hostel’s free shuttle to the natural hot springs where we spent a relaxing hour lounging about in the weirdly hot pools of water. Sitting in the water as it flows all around you, looking up at the trees and sky above is a very surreal experience. 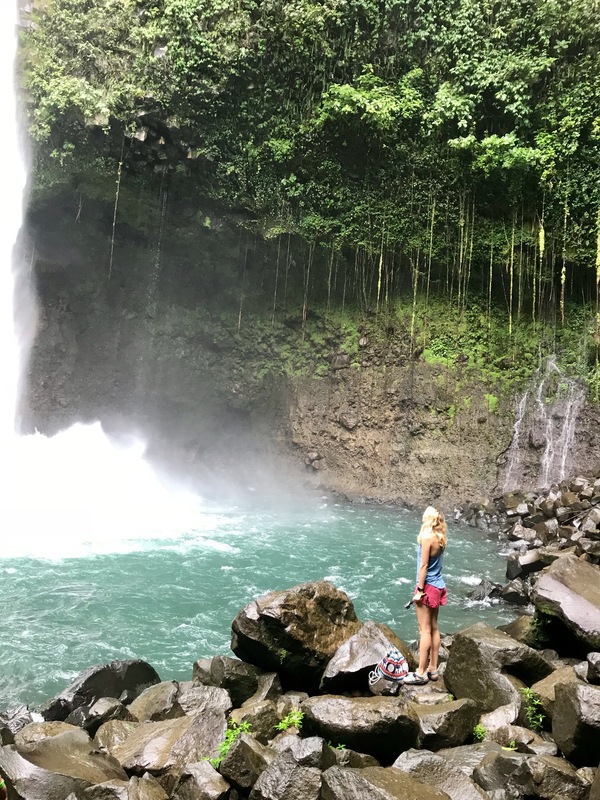 Our next day in La Fortuna took us to the enormous waterfall of the same name. Despite the extortionate entry fee to the park, we enjoyed an awesome morning exploring – myself and Tegan even braved the freezing cold water running off the cascades falling from above! We walked all the way back to town from the waterfall and made a puppy friend on the way – he followed us all the way down the hill and we named him ‘the happiest dog in the world’. It was time to move on too soon and we’d opted for the easiest and quickest route to Monteverde – a jeep/boat/jeep trip across Arenal Lake. It wasn’t really a jeep, but a shuttle bus that took us to the lake, where we boarded a boat and (very slowly) made our way across the water. This would have been awesome, had it not been pouring with rain and super cloudy, so we go absolutely no view of the volcano whatsoever. 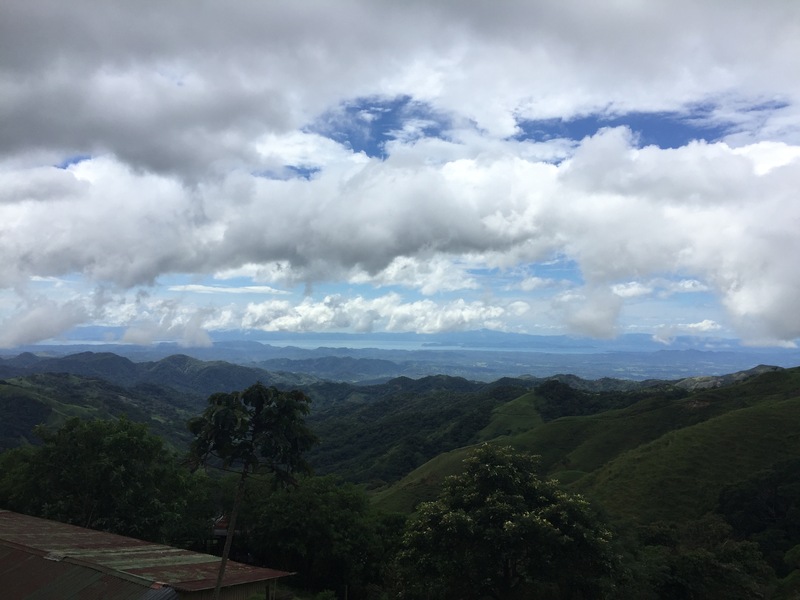 But oh well – we made it to Monteverde without a hitch and settled into our next home for the next few days – the lovely Hostel La Suerte, run by a wonderful Costa Rican family and just a short walk outside of town. The girls had booked to do a canopy tour that afternoon so they headed off into the rain for a zip lining adventure, while Conor and I opted to stay and explore the town (zip lines and giant swings aren’t really our thing). We got some local coffee and spent the afternoon just the two of us for the first time in quite a while. The girls came back with mixed reviews of the canopy tour, with Tegan and Rachel having loved it, but Mel wasn’t so sure. The videos they got on my GoPro did look pretty cool though – although not cool enough to make me ever go on a zip line high above the trees! 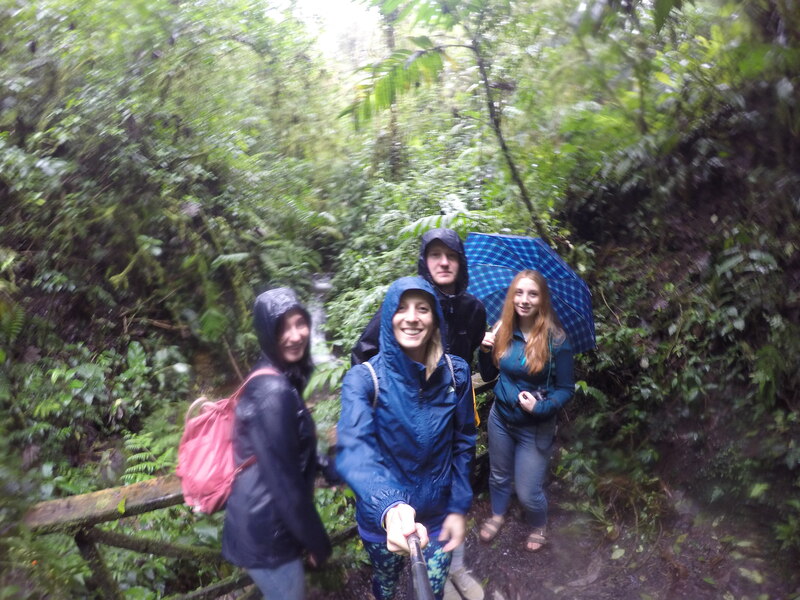 One thing I did want to do was to hike through the cloud forest, so we hopped on a bus the next morning and did just that. Last time I was there I went to Monteverde Cloud Forest, so this time we went to Santa Elena Cloud Forest Reserve, which was just as impressive. It was absolutely pouring with rain but we had the best time hiking the trails and marvelling at how we were literally inside or above the clouds. Everything was so green! Then before we knew it, our last night as a group of 5 was upon us. We’d been travelling together since we left Cartagena and did the San Blas trip, 3 weeks earlier, so it was strange to be saying goodbye. The girls were heading to Jaco and then San Jose to fly on to their next countries, while myself and Conor were heading to Sámara, to spend the last days of our trip exploring the beaches on the Pacific coast. We were going to be just the two of us again and it was very strange to think we wouldn’t be seeing these girls again for quite some time. But there are people you meet travelling and you just know that sometime, somewhere, your paths will cross again, so it was see you later, not goodbye. 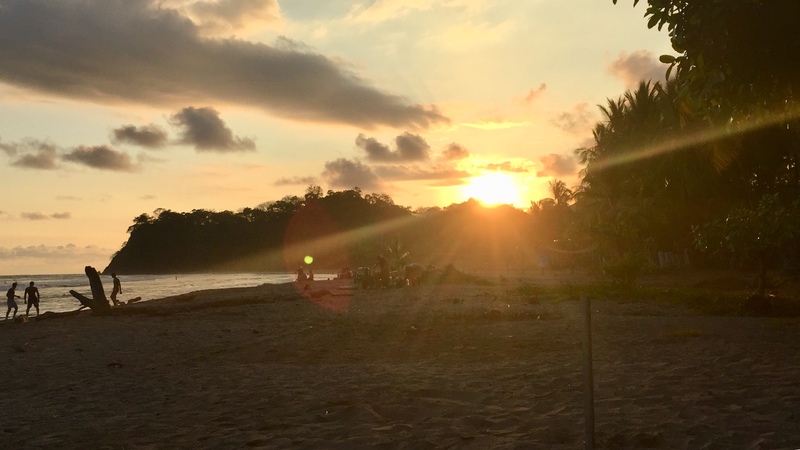 I was so, so happy when we arrived in Sámara the next afternoon – it was one of my favourite places on my first trip to Costa Rica and it was awesome to find that it still had that same charm that only little beach towns have. 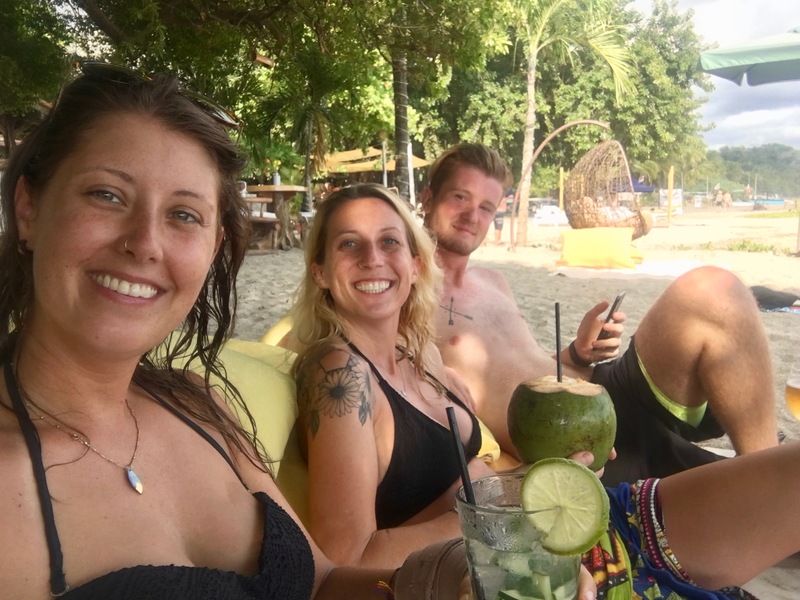 We both fell in love with it almost immediately and decided we’d definitely be staying a while – we settled into our new home at Kiban’s Surf Hostel pretty quickly! And stay we did. Another friend from San Blas, Rachael, came and joined us about 4 days later and we were going to rent a car to go up the coast and see the turtles in Ostional, but we quickly discovered that the roads are super sketchy to drive, car rentals are expensive and we’s got the timing wrong to see the mass arrivals of the turtles for their nesting season – the previously laid eggs had just hatched the week before and there wouldn’t be a new arribada until the start of December. We were obviously disappointed but also we had absolutely loved the time we’d spent in Sámara, so decided to just stay there until we had to fly back to New York at the end of the month – a full week longer than originally planned! It turned out to be the BEST decision ever. It was amazing to essentially have a little holiday at the end of our trip – we found an amazing beach restaurant with sun loungers and incredible cocktails so spent our days there, enjoying the sunshine. I read books, listened to music, ate great food and surfed every day. I’d almost forgotten the indescribable feeling of riding a wave and it was magic to be back in the water on the board after so long. I’m by no means a very good surfer, but just being in the sea and pushing myself to get better each time was everything I needed. And now, it’s November 29th, a date that has held so much importance throughout our whole trip, signifying the end, and I’m sitting at Liberia airport, waiting to board our flight to NYC. The trip is over and it’s time to head back to reality. No more moving from place to place, sleeping in different beds every night, no more beach, no more surf, no more sunshine. To be honest I’m pretty gutted to be going back to winter, but I’m insanely excited to see everyone who lives in those wintery countries, people I haven’t seen since I left London way back in April. And this definitely isn’t the end of my Central and South American travels – I have plans for future trips already forming. And Sámara is top of the list, for sure!